Over the weekend I ventured out to one of Ottolenghi’s restaurants, NOPI, for some pretty momentous grub. There is a lot to say about NOPI – the beautiful rose marble and brass finishes, floor-to-ceiling faceted mirrored toilets, oh and did I mention the food? We shared a plate (or two) of creamy burrata, courgette fritters with cardamom yoghurt, delicate mackerel and for dessert…peanut ice-cream with nut brittle. But out of all the interesting food on offer, what really caught my eye was something relatively straightforward – ‘cornish potatoes with anchovy salsa.’ I had little idea of what they would actually be like but I knew I had to have them. 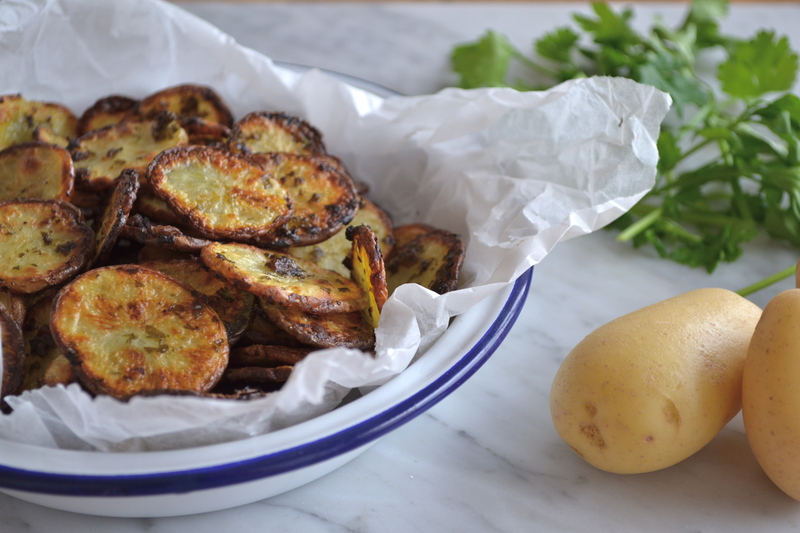 What arrived was essentially a bowl of salty, pimped up chips – undeniably moreish and, luckily for you and me, I’ve worked out how you can recreate them from the comfort of your own kitchen. For those who are anchovy averse, fear not – simply skip them and add a little salt instead. There really is nothing not to like about this roast potato/crisp recipe mash(geddit????)-up. Preheat your oven to 180°. 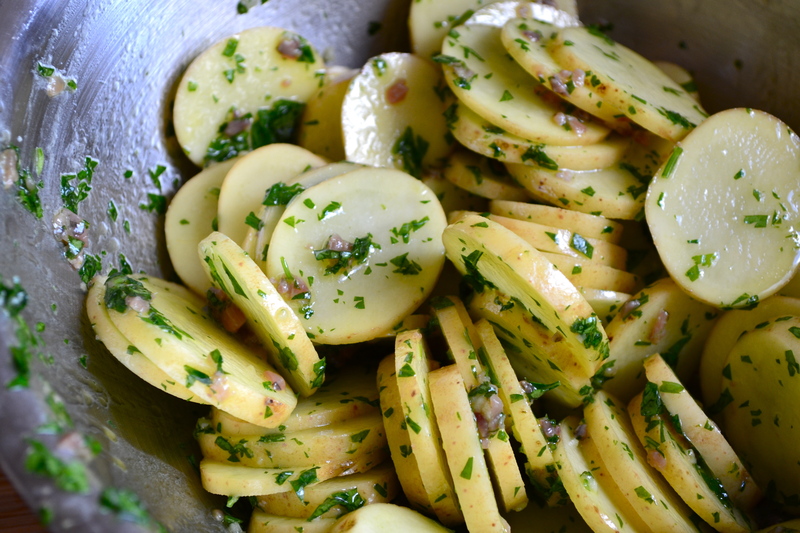 Combine all the ingredients together in a bowl and mix to coat the potatoes evenly. Line 2 baking trays with greaseproof paper. 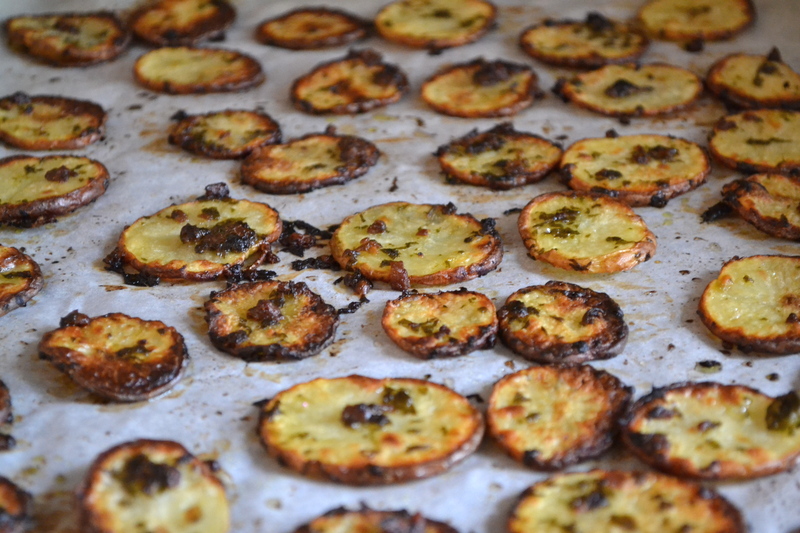 Spread the potatoes out on the trays and bake for around 25min until golden.